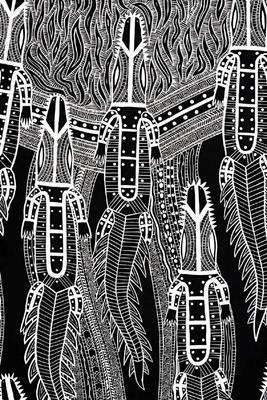 2012 Primavera artist Teho Ropeyarn, Cairns-based originally from Injinoo, Cape York Peninsula, will launch his solo print exhibition ‘Mandang Ikamba’ on Friday 14th of June at 6pm, at Canopy Artspace Gallery, 124 Grafton St in Cairns, Queensland. Mandang Ikamba translates as ‘strength of a crocodile’ in Injinoo ‘Ikya’ Aboriginal language. Cairns-based Master Printer Theo Tremblay will officially launch Mandang Ikamba, a personal journey of Teho in recognition of his culture. Mr. Tremblay mentored Teho in 2011 while on an Australia Council JUMP grant, a national mentoring scheme, assisting Teho to produce large relief prints on heavy rag paper. A selection of twelve works will be on view and will be for sale. Teho has recently been nominated, for the second consecutive time, into the annual Telstra National Aboriginal and Torres Strait Islander Art Award in Darwin this year. Mandang Ikamba will feature medium to large-scale intricate, yet bold, lino and vinyl relief prints depicting Teho’s culture; stories, totems, clans, country, environment and his home community of Injinoo. Mandang Ikamba reflects Teho’s passion to restore and preserve old stories passed down from Injinoo Elders. “It’s about keeping culture alive, it’s about being the ikamba (crocodile) and the strength it has to stay alive and survive”, said Teho. Teho Ropeyarn was born in Mount Isa in 1988 and currently lives and works in Cairns. Teho comes from the Angkamuthi and Yadhaykana clans from Injinoo on the mainland, Badu, Moa and Murray Island in the Torres Strait on his Father’s side and Woppaburra people (Great Keppel Island) and Batchulla people (Fraser Island) on his Mother’s side. 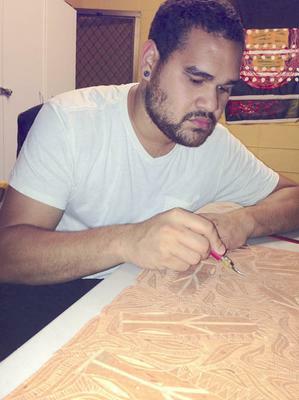 Teho’s printmaking journey began in 2010 on his return to his home community of Injinoo after four years of study in Sydney. Teho holds a Bachelor of Fine Arts from the University of New South Wales - College Of Fine Arts in Sydney. Although his major studies were in painting and drawing, Teho participated in elective classes such as printmaking and ceramics and since then he has been heavily involved in printmaking. Teho’s contemporary style of designs and patterning includes cultural symbols that connect Teho to the spirit of his clans. Teho’s work is recognised through his unique carving techniques, which emphasize the rhythm, composition and overall aesthetic of his works. “My artwork reflects the continuation of cultural knowledge passed down from generations long ago, onto our Elders, who are now passing on all aspect of culture; language, tribal stories, significant land marks and rituals, dancing and beliefs to the next generation. The stories, I use, in my works were told to me by my Elders during cultural lessons in School and over the years. It is important that cultural knowledge is passed down from our Elders and that they teach language, tribal stories, art, dancing and cultural beliefs to the next generation to carry on the 40,000+ year old ancient culture we breathe today”, says Teho. “We are in a day and age where culture and grass root knowledge is slowly deteriorating due to Elders passing, our ever-changing lifestyle and social disadvantages in our communities, practicing art is one way of maintaining and developing culture and has always been a part of Aboriginal culture. Through this tradition, it will preserve my culture in one way for years to come”. Teho dedicates his solo print exhibition, Mandang Ikamba, to the Elders – past and present of his Community of Injinoo and in recognition for the survival and preservation of his culture for future generations. “It is through our past and present Elders, that, our culture continues to live and I am continuing the culture through my practice as a print maker”, said Teho. Mandang Ikamba translates as ‘strength of a crocodile’ in the Injinoo Ikya language of his people. When Teho’s Elder and Aunty Rev. Mary Eseli chose the language ‘mandang ikamba’ for the title of his work, it meant a great deal to him and for the future of his people. Teho reflected on the issues affecting his people and today’s lifestyle and society which has had many negative and some positive impacts on the future of his culture, language and stories. The title of the work and exhibition expressed the notion for keeping culture alive. Teho’s Aunty Rev. Mary Eseli explained to him that the crocodile knows its territory from birth. The crocodile is patient, a guardian of his territory. The crocodile will travel away but always come back to the area where it lives. “We need to be strong like the crocodile. It has survived thousands of years and lived alongside our people for over 40,000+ years”, Teho says. “If we become the crocodile, our culture and language will be protected for the future generations to come”. Teho’s successful journey so far includes participating in the Primavera 2012 exhibition at the Museum of Contemporary Arts in Sydney, 11th Nationwide Academies of Fine Arts Printmaking Biennial, Guangzhou Academy of Fine Arts, Guangzhou, China 2012, Queensland Regional Art Award 2012 – Xstrata young artist development award winner with his work featuring in ‘The Essential Character of Queensland’ – Queensland Regional Art Award touring exhibition 2013, two-time finalist in the 29th and 30th Telstra National Aboriginal and Torres Strait Islander Art Award at the Museum and Art Gallery of Northern Territory, the Cairns Indigenous Art Fair 2012 exhibition – ‘Where the art leads: new exploration by Queensland Indigenous Artists’, Naissance 2013 – Far North Queensland Emerging artists at the Cairns Regional Gallery, Story Boat exhibition at Cairns Regional Gallery and the InkMasters Print exhibition at the Tanks Arts Centre in 2012. Teho has completed the Australia Council for the Arts’ JUMP Mentoring Program and was awarded an ArtStart Grant 2012. He is currently the full-time Gallery Curator at UMI Arts, the peak Indigenous arts and cultural organisation of Far North Queensland. Please celebrate with Teho on Friday 14th of June at 6pm as he launches his solo exhibition Mandang Ikamba. Mandang Ikamba will be open to the public from Friday 14th of June to Sunday 14th of July, 2013. Canopy Artspace Gallery opening hours is 10am - 6pm Tuesday-Saturday and located on 124 Grafton St, Cairns in Queensland.